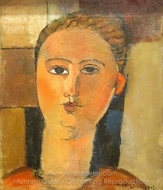 Amedeo Clemente Modigliani was an Italian painter and sculptor. 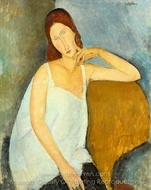 Modigliani was born in Livorno, Italy and began his artistic studies in Italy before moving to Paris in 1906, where he developed his unique style. 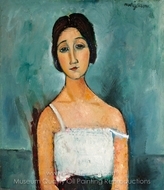 Influenced by the artists in his circle of friends, and by primitive art, Modigliani's oeuvre was nonetheless unique. 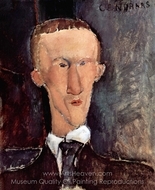 He died of tubercular meningitis - exacerbated by a lifestyle of excess - at the age of 35. 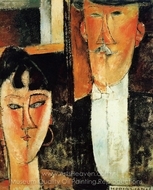 Modigliani was the fourth child of Flaminio Modigliani and his wife, Eugenia Garsin. His father was in the money-changing business, but when the business went bankrupt, the family lived in dire poverty. In fact, Amedeo's birth saved the family from certain ruin, as, according to an ancient law, creditors could not seize the bed of a pregnant woman or a mother with a newborn child. When bailiffs entered the family home, just as Eugenia went into labour, the family protected their most valuable assets by piling them on top of the expectant mother. Beset with health problems after a bout of typhoid at the age of fourteen, two years later he contracted the tuberculosis which would affect him for the rest of his life. "The child's character is still so unformed that I cannot say what I think of it. He behaves like a spoiled child, but he does not lack intelligence. We shall have to wait and see what is inside this chrysalis. Perhaps an artist?"